2. Yeah, to my knowledge a "method" is just C# speak for a "function". If you want to access it from another component though, you need to make it public, i.e. "public void Damage()"
- A function is a method that has a return type. - A procedure is method that does not. So "public void Damage()" would be a procedure not a function. These are just technicalities though. Looking at it the other way around may make it a bit clearer. An Object is something that collects together data describing something, and methods that act on that data. Practically, when talking about C# code, you can safely use the terms function and method interchangeably, since there are no functions NOT associated with classes (which just describe objects). There are instance and static methods. As their names suggest, instance methods are associated with and act on a particular instance of a class (a particular object). Conversely static methods are not related to instances, and only have access to data shared across all instances of a class (static data). While it's not strictly necessary for you to get stuff done, when you get a chance it's worth going over Wikipedia's article on OO, it may help understand some of these distinctions: http://en.wikipedia.org/wiki/Object-oriented_programming. While there are classes to represent most of the Unity concepts (eg there is a class GameObject), when working in Unity it helps to think primarily in terms of their higher level objects. I'm using a raycast to detect bullet vs enemy collision, but when my bullet is generated "inside" the enemy's collider, it's not detected as a hit - is there a way to have the collision detect even if it originated inside the collider? In fact, if a raycast gets intersected by an object that moves in parallel from the ray, it doesn't detect as a hit... So if bullet went under my ship, and the ship drops onto the bullet, the collision doesn't fire... Is there a way around this except running multiple rayscasts? I used OnCollisionEnter to start but then when I wanted to work with layers and tags it didn't seem to work easily. Ruan (Free Lives) suggested that using raycasts for projectiles were easier and didn't have to worry about the collision matrix or physics (or something like that, I can't remember properly anymore, it was over Twitter). So it seems like raycasts don't work on anything parallel to it? I should go back to OnCollisionEnter? Raycasts work fine, though I think OnCollisionEnter() is just easier to understand. you are using the raycast on your bullet to detect the collision, every bullet, every frame raycasts. might be a problem if you have tonnes of bullets flying around, not sure though. I would personally use OnCollisionEnter() on projectiles, but raycasts on a gun. I can't see why your bullet is created inside the enemy based on the code you have posted. have a look at where you instantiate the bullet. you could try to hack it :P increase the length of your raycast, then test the distance from the bullet to the hit point, and if close enough, do the stuff. OnCollision/TriggerEnter/stay/exit all work fine with only a collider I believe. Just a quick question (and maybe irrelevant) but how / why do bullets originate in the enemy in the first place? Have you tried using Physics.SphereCast? It would depend on the speed of the projectile, if it is moving too quickly (moving large units between each frame) some collisions won't be fired since the projectile would have not actually collided with the object. "Note that collision events are only sent if one of the colliders also has a non-kinematic rigidbody attached." "Note that trigger events are only sent if one of the colliders also has a rigidbody attached." ah, very true. but when such problems arise, prediction and guessing (interpolate and extrapolate) comes in handy. Indeed, I apologize for not checking my facts, my bad. though here is the thing right. in my E comp entry I did exactly what I said there. my doors only have a collider on, no rigid body. But my monster has a rigidbody and as such can open doors. @CorruptedHeart oooh that's interesting I'll try sphereCast, it looks very expensive? But I guess I shouldn't care about that. Though I wonder why raycast wouldn't work where sphereCast would. @Pixel_Reaper I would love to use OnCollisionEnter but that would necessitate rigidbodies and I don't want to overcomplicate the physics and whatnot... Is there a way to OnCollisionEnter with moving via Translate instead of AddForce? You can set your rigidbodies to be kinematic in the inspector. As far as I know, this makes them ignore physics except for the purposes of collision detection. @Tuism Not 100% sure. I very rarely use translate. Though if you had a rigidbody on your objects which you just confine on its axis. you should be able to use both translate and OnCollisionEnter, without the physics math involved. You don't need rigid bodies for collision detection. Just colliders. Rigid bodies are for physics simulation. You can also decrease the update step size somewhere in the settings. Alternatives for bullets are: make them slower, use rays for bullet hits and just animate the bullet separately (this is how most shooters does them) or predict a few frames ahead with rays while the bullet is flying. @farsicon, does that mean OnCollisionEnter works without rigidbodies? Does that mean OnCollisionEnter work with moving stuff with Translate? The enemy bullet has a box collider, no rigidbody. The player object has a rigidbody, and a box collider. Right now when the bullet hits the player object from the front, it's a hit. That's done with a raycast (code above). I can make the player collider isTrigger, but then the bullet just carries on going. It might be a little bit more expensive, I haven't really noticed. I was using Physics.Raycast for my bullet handling (in a project I am going to post soon) however it was doing odd things like shooting through walls sometimes. Switched to Physics.SphereCast and those errors disappeared. @CorruptedHeart oooh that's interesting I'll try sphereCast, it looks very expensive? So I suspect SphereCasts follow the same principle just with a thicker stroke - collision is still calculated on the ray at facing polygons. Oh wait... TriggerEnter... Hmmmmm, does making things isTrigger break anything about the physics? As a general rule anything that overcomplicates your logic is a bad idea :) If it's absolutely necessary to use a bunch of different approaches to achieve your goals, then fine, but it really shouldn't be and it's just going to make things progressively more confusing as your project gains more features. @Tuism... it's a great idea even if they are not ;) For prototyping, it can get you past this hurdle and onto more important things. You may later find that your bullets have different properties only after spending a lot of time trying to fix this. Also, don't forget that it's all about illusion; not realism. Don't get bogged down in the detail. (And yes, it may be an improtant detail... but you don't know until you relax constraints). Omitted the rest because I *know* it does run and does not pertain to this question. I have a public variable declared. A reference to a GUIText object so I can change the GUI on the fly. I have a prefab that's not on the scene yet... I can't drag the GUIText instance on the scene to the public variable in the editor... I can if the object was in the scene already, but I can't if it's sitting in prefab. In fact if I drag the prefab out, set the public variable, then apply and delete it, the prefab variable gets reset to None. How would an instantiated object make reference to something that's already in the scene? Can/should I fill that variable with something like a GetInstance or something? Prefabs are reusable across multiple scenes, so you can't have one that references an object in a specific scene. Do you need a public variable at all? Maybe you can just use GameObject.Find? Thaaat's the one! So I can have a public variable, then when it gets instantiated, in Start, Find the specific GUI object and fill the public variable with it to use for the lifetime of the instance, right? 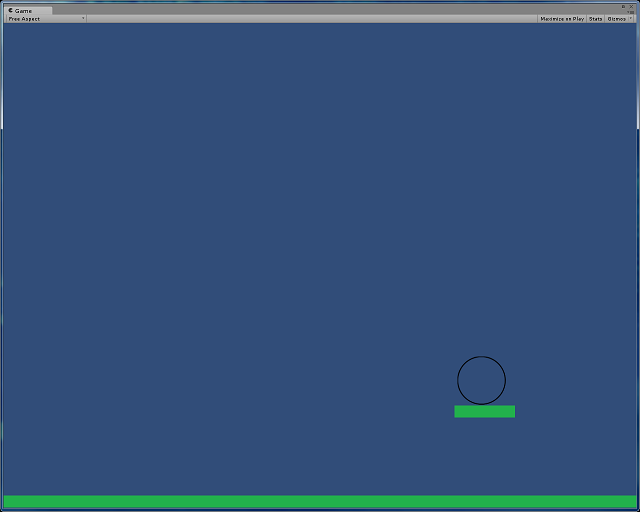 Hey guys, so I started playing with Unity 4.3 today (the first time Im actually going to try make something in Unity). I am trying to figure out to to get if something has been clicked? In 2D Toolkit I know you can create the OnInput function and then just handle it in there. What do I need to do in 4.3? Next question (sorry, gonna be spamming this thread for a while :P). I am trying to make a progress bar. I placed a sprite over another sprite and in my script I just set the scale of my overlay sprite. Yay, it works, except that the overlay scales from the center out. How can I anchor it to the left and scale out to the right? Hmmm...still new to Unity. How do I set a pivot point? Don't you set pivot points based on the position of an object in the gameObject? Basically where 0,0 is is the pivot point. But I've had tons of problems around that, it's not as clear-cut as it seemingly should be. Ok, but this still doesnt solve the fact that its going to scale out from the middle does it? If you scale the parent gameobject (the one that you're using as a fake pivot), the child objects should scale from there instead of from wherever their local pivots are. So the platform I am on doesnt return true until I make it wider?!?! Your collider might not scale correctly with your ground. So how do I scale my collider? Choose the gameobject in the hierarchy so that it's components are shown in the inspector. The collider will be one of the components. You will be able to scale it there. This works perfectly the first time I do it. When I do the process again in the same game(so, by my understanding, instantiating all the icons again) when I click on an icon, I get the following error:MissingReferenceException: The object of type 'IconBase' has been destroyed but you are still trying to access it.